quality I must agree this first run was a substantial bargain." to tell you how impressed I was w/ the quality of your work! We are proud to offer P-90 pickup covers as our Newest Addition to the store! Nobody "CUTS CORNERS" better than GUILFORD GUITARS !! This is a closeup of a Nasty CORNER - Hecko in China!! Brought to you by a popular supply house. IS THIS where you want your money to go? This is where you buy the best guitar you will ever own. Handmade American quality, exquisite beauty and tone. Unrivaled playability, lovingly crafted from our select tonewoods by master luthier John Guilford. Our Pickup Rings are the best in the WORLD - NOBODY does them better than we do! We call them our Holy Grail sets for a reason: You've been looking. You want it all and you want it done right. These sets DELIVER! Common upgrades for PRS (tm) and Gibson (tm) guitars! If you don't see what you need, CONTACT US! We've got your Back Jack! Our backplates are precision fit and top quality. Don't be surprised if you rest your guitar on the stand backwards just so you can enjoy the view! If you have a shape that you don't see here, CONTACT US! Better than a chocolate covered cherry! Only the finest precision cutting techniques and materials can produce our P-90 pickup covers. Stock spec is for Seymour Duncan pole spacing (also compatible with PRS [tm]). CONTACT US if you have another brand and want the best! Made by hand with special care for the perfect finish on a great guitar! THESE ARE THE HENS TEETH OF ALL GUITARS PARTS - WORTH IT! 6MM precison milled for a press fit. No need for a set screw, CLEAN and TRUE from US to YOU! We offer the best little pieces of wood you can find for a very specific purpose. TONE is the game. Save TIME and EFFORT finding and processing the right piece of wood. We GOT this! You can get ANY kind of cover your guitar requires. We stock the most popular types. CONTACT US if you have a different requirement. Because we make some of the finest electric guitars in the world, we understand how passionate one can be about choosing the right woods for your next build. You do not have to jump in a dumpster at Gibson or PRS or hit and miss buying from a wholesale lumber yard or even worse, [some outfit on Ebay] just to find that special piece of wood! You want a guitar that is every bit as good as the pros, and nothing else will do. We can easily provide you the materials that are specific to high end Electric Guitars! BUY YOUR ELECTRIC GUITAR WOODS direct from a US guitar manufacturer and get premium material for your next build! We are proud to offer our own raw materials DIRECT TO YOU. The highest in fashion wear for the Music Industry! Equally valid under a sport coat, at a concert or your backyard. Designed by a REAL old school Chicago MAD MAN, Our Guilford Logo has gone GLOBAL hundreds of times over! YOU ARE AT THE RIGHT PLACE - NOTHING HAS CHANGED ABOUT THE PRODUCT. THE SHOPPING CART HAS BEEN UPDATED AND NEW PRODUCTS HAVE BEEN ADDED. YOU ARE AT THE SOURCE FOR THE BEST SUPPLY OF WOOD GUITAR PARTS AVAILABLE ANYWHERE!! 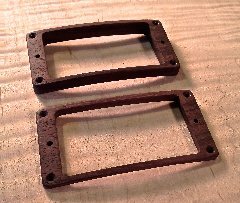 After THOUSANDS of rings and happy customers - GUILFORD GUITARS is your definitive choice for custom wood guitar parts. 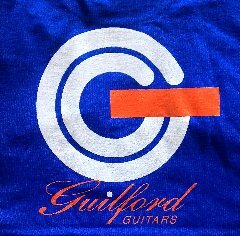 Q: Why buy your guitar parts from GUILFORD GUITARS? A: Because we build only in small batches and each part is treated with maximum care! B: Because if we can build for companies like Gibson Guitars USA, there is nothing we can't handle. AND CUSTOMER SERVICE YOU GET HERE. Stand for something worthwhile! ASK YOUR LOCAL DEALER TO STOCK OUR PRODUCTS!! (They will thank you). 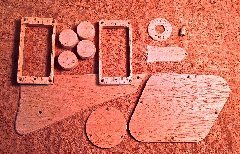 This site is dedicated entirely to bringing you the finest quality wood guitar parts available in a variety of wood choices. THIS IS IT. Your guitar will look SO MUCH BETTER with a simple installation of genuine wood parts. Why spend hundreds and often thousands of dollars on your guitar and not go all the way with it? Ever ask yourself why a 2 thousand dollar guitar doesn't have the plastic ring tabs sanded off? A - They don't care enough to bother. 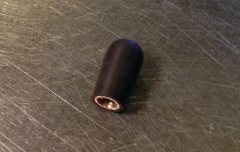 The effect on your sound is noticeable - plastic rings have nothing to do with tone - wood does. There is much debate about this but the science tells you simply - "Everything has an effect on Everything". And it really is this simple: It's either Plastic, sometimes metal or Wood for your guitar. Which would you rather have working for you? Wood is the best choice when you think about it - The visual effect is amazing - your guitar goes from stock to OMG!!. Your guitar will increase in value, sound, beauty and individuality once the rings are installed. Plastic rings, while traditional and easy to produce, have offered stability and consistency to guitar makers for many years. The same can be said for metal pickup rings. To be sure, that is why guitar manufacturers have and continue to produce pickup rings from those materials with great success. A guitar should be as musical as possible - that is its purpose after all - it is an instrument from which one can create music. From an engineering perspective you look at each component of a guitar and ask if it is contributing to the sound and the tone of the instrument, whether it can contribute, whether it is indifferent or perhaps even detrimental to the sound of a guitar. When wood is selected as a material for pickup rings, back plates, truss covers or even our new "Trem Blocks", it brings to the guitar an intrinsic beauty and a sublte improvement in sound that can't be obtained from plastic or metal. Customers who were convinced this was not possible have emailed to confirm to their suprise that they in fact noticed a slight improvement in the sound of their guitar. The beauty that these pickup rings bring to the guitar give the player a higher form of experience when looking at or playing the guitar. It pleases more of your senses and that has everything to do with inspiration and creativity. Sometimes, the pickup rings are produced with the grain running from top to bottom as is usually the case with maple. Indian rosewood and other darker exotic woods have increased strength and stability when cut side to side and that ensures a more durable ring, and a better fit. Once they are in place, they hold a pickup very securely while offering the right visual vibe. Eddie Van Halen once stated that he felt the sound of a pickup was improved once it was screwed directly into the wood. That is the importance of the wood-rings-to-pickup contact - It purifies the relationship between the pickup itself and the rest of the guitar.